Epson’s WorkForce 600 is a stylish multifunction device ideal for a home office or small-business with a copier, scanner, fax, and photo printer. It’s designed to compete with the speed of more expensive laser printer while still producing superior ink-jet photos. In our time tests, we found that while the WorkForce 600 is not as fast as a laser printer- it is one of the fastest and most well rounded ink-jet printers around. Equipped with Wi-Fi, Ethernet, and USB connectivity, the WorkForce 600 can be tethered to one computer or serve a small workgroup. It’s easy to setup a wireless connection for tasks such as printing, scanning, determining the ink levels, and cleaning the print heads. Most of these tasks can also be performed using the control panel on the device itself, with the exception of scanning. We had problems with the scan button on the WorkForce 600’s LCD screen and could only scan successfully when using the Epson Scan software on our Mac. The printer features a black design meant to not only look nice in an office, but fit into a home’s decorating scheme, much as a stereo or DVD player would. The 2.5-inch LCD screen flips out on a panel in the middle of the compact design, allowing for ease of use. Users can copy, scan, and fax from the panel, but also view and print uploaded photos from the three memory card slots. Epson offers an “Extra-high Capacity” black ink cartridge ($29) that give you 3.5 times as many prints for less than twice the price of their standard black ink cartridge ($17). Epson also sells a “High-Capacity” black cartridge ($20) and “High-Capacity” cyan, magenta, or yellow cartridges ($17). Standard capacity black ink is $17; cyan, magenta or yellow is $12. The WorkForce 600’s ink is smudge-, fade-, and water-resistant. The ink instantly dries after printing. The WorkForce 600 may not be laser printer quick but it’s plenty zippy. 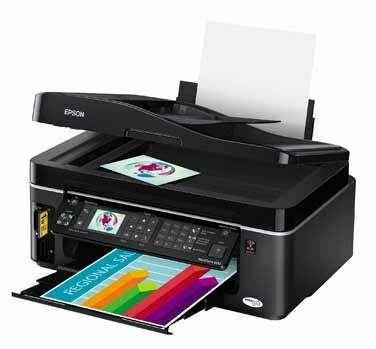 Compared to Epson’s Stylus Photo 1400 ( ) (our current Top Product in the ink-jet printer category), the WorkForce 600 was 60 percent faster in our timed-trials when producing a single black text document, printing a page in under eleven seconds. The printer was able to print a 10-page document in 51 seconds, compared to the 2 minute mark that is standard with most competing multi-function printers. While these times are quick and are within the range of laser printers’ speeds, the WorkForce 600 is considerably slower when producing color. It took the printer just under a minute to produce our four-page PDF and 2 minutes, 45 seconds to print our 22MB Photoshop image. Comparatively, high-end laser printers can produce color images, albeit of less quality, in nearly half that time. Brother’s HL-4070CDW ( ), for example, finished our 22MB Photoshop image in just under a minute while the four page PDF test took 35 seconds. However, Epson claims that the WorkForce 600 consumes considerably less power than a laser printer. However, the WorkForce 600 does produce strong color prints. We determined that the fine lines, gradients, Photoshop image quality, and text quality are all of Very Good quality. We did find that images had an annoying amount of glare that was distracting to our jurors. When it came to the device’s copier and scanner, we found that the scan tests for color and clarity both achieved Very Good scores, but our clarity test revealed that the scanner dropped the lightest shades of gray; image printed brighter and with less contrast than they should, and gradients weren’t complete. The copy test was the only weak point in the jury examinations; we found the blacks to be flat and there were visible dots throughout the image. On a copy of our test photo document, we found some details were lost or blurry and the overall print quality was lackluster, barely earning a Good rating. The WorkForce 600 is one of the fastest ink-jet printers out there, producing quality photo printing and scanning. While its copying capabilities are only decent and the overall print quality does not challenge the best ink-jets, it’s still a solid all-around printer that isn’t an eyesore, either.